Many years ago some kind soul on the forums bought me the book cheap and since I have no use of it I am offering to send it via post , all I ask is the the postage be paid either via Paypal or Daz3D gift card. I will get it weighed and priced up. But please make sure you really want it and will use it, I never really did. I know some love the program hence why I am offering it up. Yes it is an old book but a lot it is still relevant as far as I can remember. I would prefer to send it to Europe, UK or USA just for ease but will consider sending it further. The book is intact with no missing pages,little bit dog eared and ingrained dust on the dust cover but it is perfectly readable. 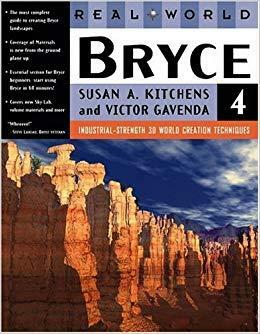 It is still one of the best, if not the best, book written about Bryce. I was charged the full price of $55 plus postage and handling, nearly CHF 100 10 years ago while others got it around the same time for $10. Expensive but best investment, I would buy it at that or even a higher price again. Oh, I was looking for it for a long time, but couldn't find it anymore. If it's still available, I would be more than pleased, if you left it to me. brilliant book. @szark, props to you for keeping it in a good new home! Thank you very much Pete. I dropped you a PM. Alex the book is now wending it's way to you, hope you get something from it. Szark...such a gesture is very rare these days...I wish more of us were like-minded: Horo recently did so with 3D goggles - all it takes is selflessness and kindness. The 'Pay it Forward' movie springs to mind. oh and for the record I think I paid 1 - 2 quid plus postage some years back. I could slap myself for not remembering the kind person who went to the second hand book stall on the market and bought it for me. Yeah, Pete...I once was stuck at the till for a few items' price, and the lady behind me saw so and cleared it (round 10 quid or so). I paid it forward a week later in intentionally leaving behind a tenner at the till counter - have no idea who benefitted. I will deposit my 5 cents. The book was published in 2001, but I bought it along with a training disk around 2006-2008. Only after reading this book did I begin to fully understand the inner harmony of Bryce. 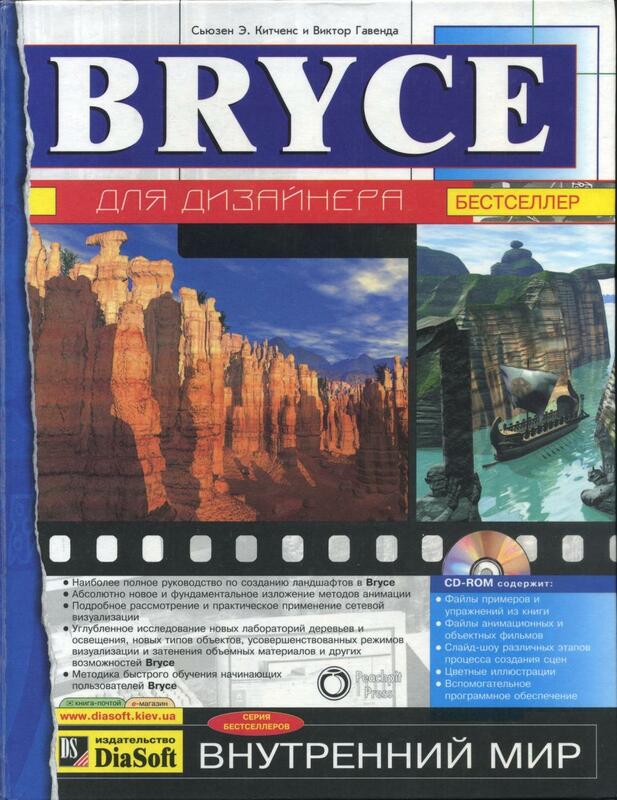 The book is called "Bryce for the designer" and fully describes the possibilities of Bryce 5. A book with a disc cost about $15. nice one Jay, hope the shop shared with someone needy. Yeah, Szark...don't know what it is...but doesn't one always feel (without prejudice or priviledge) better when making such anonymous gestures. Again, the movie 'Pay it forward'. OT The trouble is separating the ones that do it because it is right and the ones that want to feel better about themselves. I subscribe to the former, it's more pure in intent. Pete (Szark)...agree entirly...trust/hope features those most siding on them. Slepalex - so cool I wonder if there are books on Bryce in other languages too. What you see is in Russian. I don't know about other languages. akmerlow - that's the one I have. I hope the CD is also included. Yes, it's attached to internal side of back cover. Sleeve is a bit broken, but still keeps it in place. Just tested on PC, i see different folders and things, and also navigation through html page.